There are a lot of carp fishing rigs to choose from but the best beginner is a simple fish finder rig or inline lead type rig. The simple inline lead rigs are very sensitive, they are easy to tie and the require very little stuff to buy. I have caught a lot of carp on this “beginner” rig and I still use it a lot today. A simple fish finder rig with inline flat lead. This is a fabulous beginner carp rig. An advanced fish finder rig with a Korda camouflaged inline lead and hair rig. This is fancy version of the same beginner carp rig. A fish finder rig is simple an inline lead threaded onto the main line with a swivel tied at the end to stop the lead from coming off. A bead of rubber protective sleeve is put in between the swivel and the lead to keep the lead from getting stuck on the bead. Finally, a leader connects the swivel and the hook. 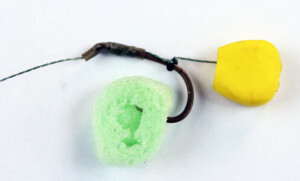 That’s it, fish finder rig is a such a great carp rig for beginners because it is so simple. However, don’t let the facts that this is a beginner rig fool you. These beginner rigs are deadly. Because the lead slides up and down the mainline, when a fish nibbles the bait a lot of that vibration is sent up the mainline without the lead interfering. This makes it much easy to tell when you are getting some action, even from very subtle carp. These fact that the lead can slide is also good because it means that the fish is less likely to feel the weight of the lead when it initially picks up the bait. Very wary fish can mouth the bait a little bit without immediately feeling tension. Once you have mastered the simple fish finder rig, you can take this beginner carp rig to the next level by using camouflaged leads, swivels, hooks and sleeves. Bit of corn on a hair rig with a piece of PVA foam nugget covering the hook point. A hair rig is also a fabulous addition to any carp rig. Hair rigs are super easy to learn how to tie using the knotless-knot. Hair rigs take more effort to bait and tie, but it allows the fish to mouth the bait without feeling the hook point immediately. Carp with their slow careful feeding habits and sensitive lips will often sense and spit out a hairless hook if they have ever been exposed to fisherman’s hooks before.